There's already enough stress around wedding planning, from deciding the perfect wedding dress to deciding who should sit next to who. But your invitations no longer have to be part of that long list of stressful things to do for the big day! These fill-in invitations will be perfect for you. They're a great template for easy invitation-making! With most of the work already done for you, all you need to do is write in the name, date, and location. It's that easy! Combined with the beautiful, floral designs of each card that will bring class and style into every invite you send! So instead of making life hard during a time when love and happiness should be in the air, try our fill-in invites and bring some needed ease! Invitation Set comes in 25 cards and envelopes. Cards measure 5 1/2 x 7 3/4. Reply Card Set comes in 25 cards and envelopes. Cards measure 4 7/8 x 3 3/8. 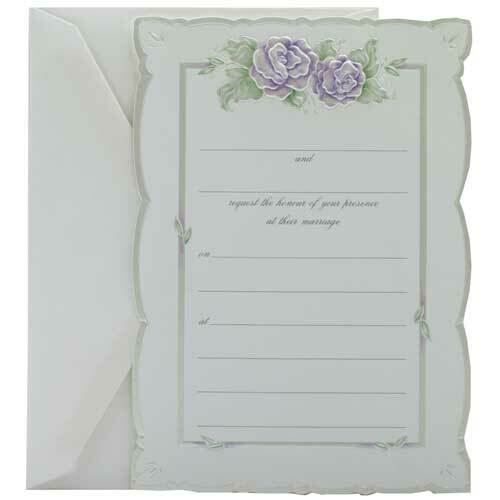 Reception Card Set comes in 25 cards (envelopes not included). Cards measure 4 7/8 x 3 3/8.